These micro gas sampling pumps are designed to provide a constant flow of air across our K-33 ICB and K-33 BLG sample draw sensors, or our K-30, CO2IR WR or CO2IR ambient sensors with tube cap kits. This makes them perfect for bench-top testing of sensors for closed-loop sampling applications. 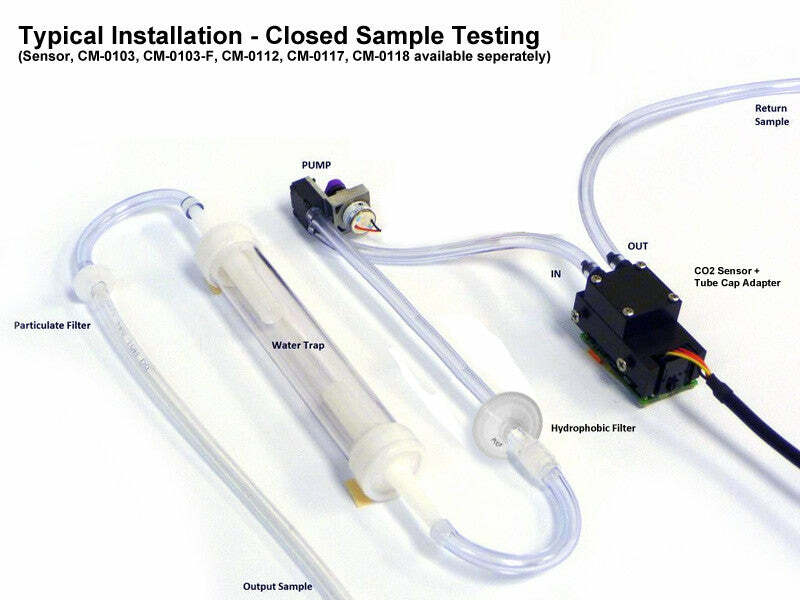 Here is an example of a closed-loop sampling application. Gas is drawn through an optional particulate filter, water trap, and hydrophobic filter for cleaning and to remove excess moisture in the gas that might foul the sensor. The pump then pushes the gas across a CO2 sensor with a tube-cap that creates a sealed system. Finally, the gas is either exhausted or returned back to the original closed-loop sample. Micro diaphragm pumps are based on the principle of the oscillating displacement pump. The motor causes an internal axle to move back and forth. This action is transferred to the elastic diaphragm which, in cooperation with the non-return valve, produces the pumping effect. Each miniature diaphragm pump we supply is calibrated, and ready to use.